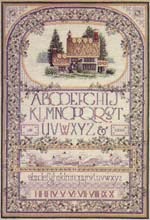 Model size: 21.5" x 14.25"
Description: This large sampler features an English cottage scene, upper and lower case ornamental alphabets, Roman numerals, a panel depicting a group of swans, and motifs composed of several different specialty stitches. The sampler is surrounded by a wide arched border of vines and flowers accented with beads. The predominant colors in this design are soft blues and greens. Background Information: This sampler was inspired by pastoral scenes from the English countryside...(my admittedly romanticized view!) It is also my first attempt at designing a piece using whole cross stitches (except for the specialty stitches, which were also a new departure for me at the time). Samplers offer unique challenges; designing them is a welcome change-of-pace for me. Letters (alphabets) are especially interesting to manipulate compositionally...they must not overpower, but rather, must compliment the rest of the design in order to achieve a pleasing balance. Stitching Comments: Because it has no quarter stitches, this piece is significantly less difficult to stitch than most of my other designs. However, it is very large, and the hand-drawn chart is a challenge to read in places. Several people have told me that this piece is the very first of my designs they attempted, because of its relative simplicity...they seemed quite pleased (and justifiably proud!) of the results. Specialty Stitches: Smyrna cross, Algerian eyelet, diagonal satin stitch, and lazy-daisy stitch.